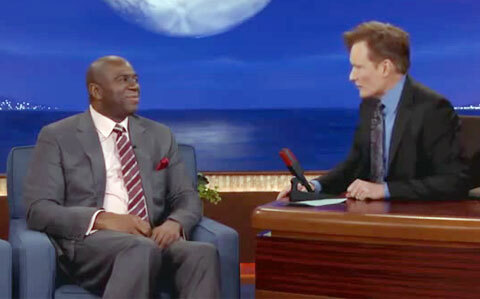 Former Lakers owner, Magic Johnson, appeared on Conan O’Brien’s show on Mar 25, 2013 speaking about the Lakers recent loss to the Golden State Warriors and how they are having trouble getting it together. Magic Johnson, a popular motivational sports speaker says PFP Talent Agency, spoke with Conan O'Brien about the fate of the Lakers 2013 season. Blog post by PFP Sports and Celebrity Talent Agency. If you would like to book basketball speakers or NBA stars like Magic Johnson for a speaking engagement, appearance or special event, you can request Magic Johnson speaker and agent information from PFP Sports and Celebrity Talent Agency or call 800.966.1380.